It’s a jungle out there. In here. And everywhere in between. Yet it is largely unexplored, despite its hidden dangers and potential benefits. This “it” is the community of microbes, a teeming multitude of multitudes that is as pervasive as it is protean, not to mention perplexing. Eager to penetrate the heart of this mystery, a consortium of scientists is proposing an expedition of sorts, a Unified Microbiome Initiative. The consortium, which includes nearly 50 scientists from Department of Energy national laboratories, universities, and research institutions, envisions a coordinated effort to discover and advance tools to understand and harness the capabilities of Earth’s microbial ecosystems. The consortium anticipates that such an effort could transform our understanding of the world and launch innovations in agriculture, energy, health, the environment, and more. The Unified Microbiome Initiative, like any expedition, must be properly outfitted and pointed in the right direction. 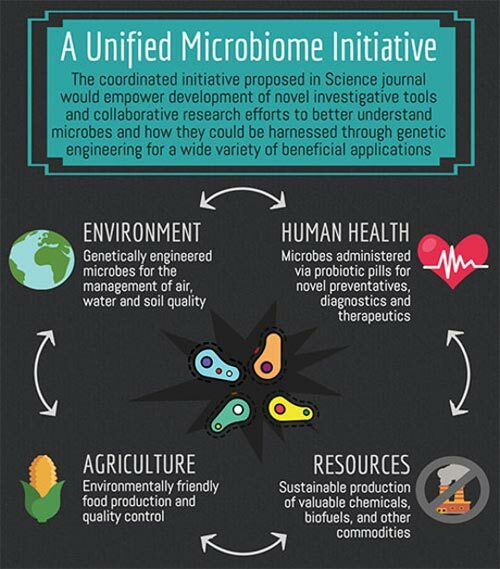 To address these needs, consortium representatives prepared a policy statement (“A unified initiative to harness Earth’s microbiomes”). It appeared October 30 in the journal Science.